The U.S. dollar (USD) has been the world’s global reserve currency for over 70 years. It was given this elite status at the Bretton Woods Conference in 1944; otherwise known as the United Nations Monetary and Financial Conference. At this conference 44 nations gathered together from July 1 to 22 in Bretton Woods New Hampshire. Their goal was to agree upon new rules for the post-WWII global monetary system. Why does having this status matter? Being given this status allows a currency to be worth much, much more than any other country’s currency. A large part of having a global reserve currency is your currency becomes global in demand. It is the international baseline currency for all trade. Countries are agreeing, in principle, to trade with your currency. Currently about 20 currencies peg their currencies to the dollar. Doing so, gives other countries a powerful medium of exchange. However, many countries, especially in East Asia, have stopped using the U.S. dollar for trading purposes. Instead they are using “bilateral trade agreements” and they’re becoming popular these days. That’s prompted rumors that the U.S. dollar’s rein as “supreme currency” could soon come to an end. Is this possible? Minneapolis Federal Reserve President Neel Kashkari said it’s possible the dollar could loose its status as the world’s reserve currency during his lifetime. Let’s explore some of the challenges the U.S. faces in retaining this title. Debt: Everyone knows that the U.S. has a debt problem. In fact, we’ve always had debt. In 1860, America’s debt was $65 million. The Civil War brought about a major spike in the debt. World War I and World War II also brought about major rises in the debt. Although the amount has fluctuated, in recent years it has skyrocketed. We are now swimming in $19 trillion in national debt. The U.S. owes almost US $3 trillion to just Japan and China alone. And regardless of whether Trump or Clinton wins the next election, the debt will only continue to grow. Value of the Dollar: The value of the U.S. dollar has been in a downtrend for the last 31 years. The U.S. dollar index, which compares the greenback to the euro, yen, pound sterling, krona, franc, and Canadian dollar, has been trending lower since 1985. Only over the past two years has the U.S. dollar increased in value relative to other major currencies. That’s not because the U.S. economy is doing so well; it’s that the other economies are doing worse. Too Many Dollars: Another problem facing the U.S. dollar is that there is too much of it in circulation. The money supply started to increase in 1984; at the same time the value of the U.S. dollar started to decline against other world currencies. To stimulate the economy following the Credit Crisis of 2008, the Federal Reserve announced three rounds of Quantitative Easing, a monetary policy that created trillions of dollars in new paper money. Throughout history, countries that have continued printing more of their money eventually saw the value of that money collapse. Negative Trade Balance: The U.S. has not had a positive balance of trade (exports minus imports) since 1976. That means since 1976 other countries have been exporting goods and services to us and we have been exporting our currency to them in return. So if countries decided against the U.S. dollar as the reserve currency, what would they use instead? Central bankers throughout the world, from Canada to Ireland, have recently suggested that they might issue a digital currency in the future. There’s also the possibility of using the Chinese Yuan, also known as the Renminbi as the worlds’ reserve currency. Countries are trading so much Yuan that it has become the second most used currency in the world, passing the EURO in 2013. If the USD is replaced, what happens to the U.S. economy? Without demand for the dollar, the end result would be a major currency devaluation and probably a drastic standard of living adjustment. Could this actually happen? Anything is possible. These rumors have been around for a while but in recent years, they are getting louder and louder. I hope the above forex currency trading information was of help to you. America’s Forex News and Currency Information source. The above information is opinion based except where noted. Always contact a licensed professional for information on the above subject or BEFORE applying or practicing the above information. Below I have listed four possible economic situations that I believe currently have a high potential of coming to reality. 1) Inflation kicks in hard and fast. Inflation must grow to support current and future growth of the Dow Jones Industrial Index prices. I’m thinking the Feds are trying hard to pull this one off by printing dollars and are counting on this to help solve the debt problem. The FED hopes that printing dollars will also help jumpstart the world economy and help the USA maintain a strong financial currency position. It’s an all or nothing approach. 2) Sharp Stock Market Correction Coming. No inflation means no support for inflated stock prices. This theory works against everything the Federal Reserve is counting on. It will mean that the Fed has failed to accomplish their above goal. 3) Major expansion of world economic growth. Expansion of economic markets world wide will help support the elevated prices of the mostly international stocks in the DOW Jones Industrial Index. Cost of hard goods goes up with some off setting efficiency plays. An orderly world order must be maintained for this scenario to play out. As of today world order is going in the opposite direction. This is when essentials inflate and stocks drop fast and hard. Conflicts disrupt the sensitive trade routes around the globe. This is a world war three type scenario and if US policy doesn’t change fast this can become reality quickly. More likely than not (three out of four indicate inflation) I’m thinking inflation is coming and your trading and retirement plans should account for inflation. Today gold is trading at about 1,330 U.S. Dollars. My information and charts indicate that Gold has a target low of 1050 U.S. Dollars with a low range from $950.00 to $1,180.00. My information and charts indicate that Silver has a target low of 17.80 U.S. Dollars with a low range from $16.00 to $19.00. Here is a link to my last opinion on gold. Euro Down / Dollar Up ? With PMI hinting at negative GDP growth in coming quarters, we can conclude that the Eurozone is approaching recessionary state at the same time that markets are punishing the monetary union by closing Greece, and now Italy, out of funding markets. There couldn’t be a more negative configuration for the Euro as the economic fundamentals depreciate the currency, and risk aversion benefits safe haven buying in US Dollar. Now, the ECB is in a realization that it’s obsession with staving off inflation was put too far ahead of being accomodative to deteriorating peripheral countries. We now expect them to retrace their two recent rate hikes and get to the previous 1.0% benchmark rate. While violent snap-backs are part of the game now when trading highly correlated currencies, their effect is similar to that of interventions from the Bank of Japan; the moves are powerful and quick in the short-term, but they lack backing to be sustainable for the long term. The US Dollar should benefit from not just the safe-haven seeking during the daily Greek and Italian bond sell-offs, but also from longer term shifts toward positive US growth relative to the Eurozone. Click here to read more from the above author….. I hope the above article was of help to you. The gold standard was a commitment by participating countries to fix the prices of their domestic currencies in terms of a specified amount of gold. The countries maintained these fixed prices by being willing to buy or sell gold to anyone at that price. It is exactly this price stability that makes the gold standard superior to fiat currency. In fact, this period proved that deflation does not always lead to depression. There was a huge expansion of trade and production during the gold standard era and yet deflation in the price level ruled the day. One of the reasons was the supply problem with gold. Since the gold price was fixed by central banks, the increased demand led to a corresponding decline in the price, which was exacerbated by quickly rising gains in global production and trade. Thus, we saw a period of deflation and real income growth. The classic gold standard period was far from perfect, financial panics still appeared. For example, the U.S. experienced The Panic of 1907, whereby stocks got hammered and banks went belly up. It was one of the primary motivating forces behind the establishment of the Federal Reserve Act of 1913. But the gold standard era ushered in a degree of global monetary cooperation and a period of rapid growth the world had never witnessed before. The cornerstone of this system was built on faith … faith that governments and their central banks would make the necessary adjustments to maintain currency parities. The above article is written in part by author, Jack Crooks who writes for Money and Markets.com. First and foremost was the fact that dollar-based credit flooded into the global economy as the U.S. ran a persistent balance of payments deficit. This credit was issued in a big way to fund the Vietnam War and the Great Society social programs. Second, countries consistently fiddled with the original dollar parities to gain an advantage on trade. In fact, the European country parities were set quite low in order to help them rebuild after WWII. The Marshall Plan also forced dollar credit into Europe so they could buy U.S. goods. However, these parities were never revised upward as was originally agreed upon. And third, the pegged system required capital controls and could not be sustained as the free flow of capital across national borders increased during this period, which is China’s problem today. Pegged rates are artificial and cause speculation. And cross border flows become destabilizing in this environment, where as such flows were stabilizing under the classic gold standard. This is why China’s pegged rate regime is untenable and leading to massive capital misallocation inside the country. It is a one-way bet by speculators who are driving hot money, which adds to China’s woes when it comes to controlling credit growth given its dangerous inflationary environment. Our current Floating Rate US Dollar System or what some refer to as the “Fiat Money Standard” allows major currencies to float against one another. The market prices are based primarily on supply and demand. It’s a system that historically there is no parallel. It really seems nonsensical that a global monetary regime can grow out of a fiat monetary system whereby there is no real backing of value for the currency other than promises by politicians. But following the breakdown of Bretton Woods that’s the system we are stuck with, which has surprisingly served us better than expected. And the U.S. dollar is at the center. Approximately 64 percent of foreign exchange reserves are denominated in U.S. dollars. That’s up about 8 percentage points since 1995, but down about 20 points since 1973. And about 60 percent of world trade is invoiced in dollars. Ultimately the dollar’s position rests on faith of those who hold it and accept it as the standard … there is no guarantee this faith will be maintained in the future. And rightfully many are concerned given turmoil of the credit crunch and related global imbalances, coupled with irresponsible fiscal spending and debt creation by the U.S. government. When we add the weight of this to the Fed’s dollar devaluation policy in an effort to reflate the global economy, it’s understandable why many expect this to be the disruptive shock that alters the equilibrium and ushers in a new international money. The World Forex Economic Game and why the USA might be in a better position then most know! I believe it was a United States General that once said “in China they play chess…in America we play poker”. You ask, what does chess and poker have to do with the Forex Market or world economics or even world power? It has just about everything to do with it when the USA is involved. You see when one plays poker it helps to have deep pockets and it also helps to know what your opponent’s next basic move will be (in chess there are so few forward moves). The USA has the deep pockets and the willingness to sacrifice a big chunk of their assets if need be or pass up taking profits just to throw the others players off balance. Right now we are witnessing the largest economic poker/chess game in the history of mankind. China has been running full out since 2008 (since the USA’s economic slowdown) self capitalizing it’s own economy to pick up the slack of falling exports to the USA and Europe. China, much like the USA did, is suffering a major real estate bubble (especially inland China). And much like the USA the Chinese Government has been pumping billions of dollars into it’s domestic economy. Unlike the USA the Chinese economy has yet to break. The USA play is to collapse it’s economy first and start rebuilding (which it did) while the other economies (players) in the world begin to falter or have yet to falter. This way the USA will be in a strong position to pick up the world economic pieces at relatively bargain basement prices. It is in my opinion that the main reason TARP funding was used back in 2009 was to save financially crippled American companies from being purchased at fire sale prices. The same goes for the US Government propping up the stock market. Many exchange listed American companies’ stock prices in March 2008 were ripe for foreign takeover. Not to mention the fact that government and pensions plans are some of the single largest holders of stock. So when China implodes watch for falling commodity prices (not so much food) and many of the foreign companies that China paid top dollar for may be available at fire sale prices. All this will be happening as the US dollar gains ground. That’s right, the US dollar will be worth more. With China and Europe falling apart the good old Yankee dollar should once again prevail. That trillion US dollars that China is sitting on, they will need it to help jump start their economy after it implodes to stop their people from overthrowing the current Chinese government. The ten trillion dollars the US Government has in circulation (much of it put into circulation over the last three years) no worries. The US dollar continues to be the reserve currency and with many third world nations and developing nations on their way up the economic ladder the dollars will be needed. 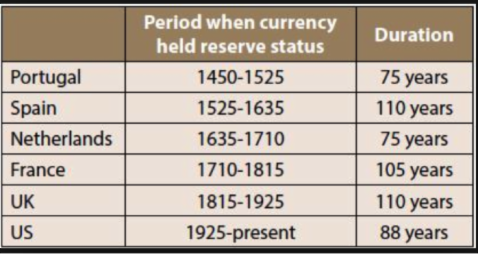 Availability of a reserve currency is almost as important as it’s strength. I hope the above currency trading article was of help to you. Why the U.S. dollar may be in a sweet spot … a place it hasn’t been for a long time. US Dollar Index Chart – the fork in the road? The 2008 -11 US Dollar (using the five year chart) uptrend support line was clearly broken to the downside back in March 2011. Currently the US Dollar continues in a narrow sideways closing triangle pattern which is nearing the end of it’s life cycle. We are approaching a point of possible decision to the upside or downside. Momentum and technicals indicate downward pressure. Liquidity and relativity to other major currencies indicate upward trend of equal pressure. Search this Blog for help info topics! Is Small Investor Money and Capital Getting Tight? Many of the world’s most used currencies have dropped in value! Binary Option Trading; what is a Currency Asset? What is the Difference Between Investing and Speculating ? FaceBook Value and Speculation or Investment ? Why the Euro Zone and EU Might Help Unite Europe ! LIBOR definition, how does it effect the Forex Markets ? Did the heavy sell-off change the picture for gold, or is the metal still worth holding? Which country has the highest amount of currency in circulation ? Will the Iraqi dinar have real value soon? Who Holds The Largest Gold Reserves? Add diversity to your overall portfolio! Allocating a portion of an investment portfolio to a Forex managed account can be a great way to enhance and diversify the overall performance of your portfolio, independently of the stock markets. Over the past few years private investors have been gaining more interest in Forex Currency Trading. A managed Forex account gives a busy investor the chance to participate in the world's largest market - the Forex Currency Trading Market. Managed accounts are an ideal consideration for those who prefer to have their Forex Currency Trading capital managed. Why a Private Currency Trading Partnership ? A Forex Currency Trading Partnership is an ideal consideration for those who prefer to have their Forex Currency Trading capital traded with a partner who is familiar with the currency markets. A Forex Currency Trading Partnership gives a busy investor or businessman a chance to participate in the International Forex Currency Trading Market, the world's largest trading market. What is a “Currency Trading Partnership” or “Forex Trading Partnership” ? A currency trading partnership is a business run by two or more partners for the purpose of trading currency for profit. Each partner brings to the table a pre-agreed expertise or asset. Copyright 2010 TradeCurrencyNow.com All content protected by copyright and any use or reproduction without permission is expressly prohibited.